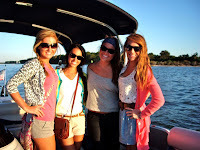 Gulf Shores Spring Break 2013 is your time to relax and have fun. A private party cruise (cocktail cruise) with a friendly, experienced Captain is the way to go. You'll enjoy hours of fun on the water, and visit some of the area's greatest hangouts, without having to worry about getting lost, running out of fuel, or damaging the boat while docking. Your group of up to 12 can kick back, listen to your own music, and enjoy the ride on our new 26' South Bay pontoon boat, complete with restroom on board. Reserve your Spring Break 2013 party cruise today, and make this year something to remember. Contact us now!